This is the first of a regular series of blog posts that feature requested items from readers of the blog. I get lots of emails every week asking me for fashion advice so I thought it would be a good idea to blog about common themes coming through in these emails. Today, it's tunics/long tops to wear with skinny jeans & leggings - asked for by Stacey. This is a great look for busy mums - avoids the dreaded builders bum and skims over the tummy/hip areas. Firstly I'll share some links to my favourite tunic stockists and further down, I'll share some do's and don'ts when wearing this look. Kicking off with a bargain from Dorothy Perkins. 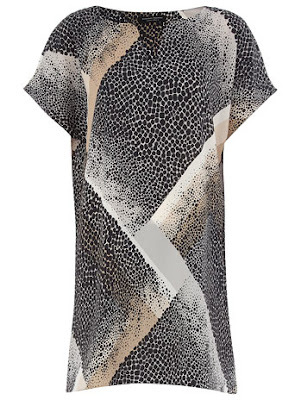 Love DP's for longer tops - this one is a good mix of autumn colours with a touch of animal print. I'd wear with grey or black skinny jeans/leggings and a long black cardigan in the cooler weather. Only £9 too! Another of my favourite stores - Seasalt with another of my favourite shapes, the cowl neck. 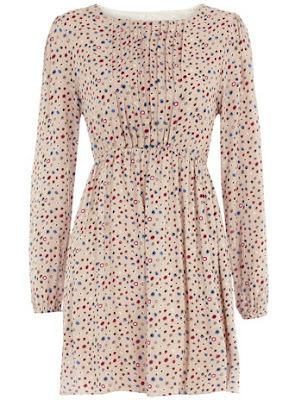 This nautical inspired tunic is perfect for throwing on with a navy cardigan and a striped or animal print scarf.. Stand by for another Dotty P bargain. 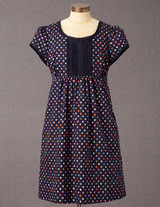 This tunic is so cute. Long sleeves too and only £16! Every wardrobe should have a cosy knitted tunic, especially at this time of year. Dorothy Perkins has this one in 4 different colours but this is my favourite. Now this is the investment piece. My good friend and fashionista Claire H bought this last week and has done the best ever clothes mathematics with it to justify the cost, as it is really very wearable in lots of different ways. Needless to say, there will be a blog post about that but for now, here is a sneaky peek. Great shape, colour and quality and a little shorter which is great for petite frames. Use AB219 for free delivery and 10% off all orders over £75. To finish, a few from H&M - great for an on-trend bargain. Firstly, check out gorgeous blogger Laura wearing her striped H&M tunic on this link - looks 100 times better on her than it does on the website! If you fancy any of these H&M ones, check out the School Gate Style Facebook page for the latest H&M discount codes - there are two I know of at the moment and you can use both on the one order! So the guide to wearing tunics? Make sure they nip you in at the right place. If you're an hourglass or pear, wear a belt. My number 1 dress rule also applies to tunics. Unless you have a wash-board stomach, wear a control vest or high waisted magic knicks underneath. People ask all the time how I regained my flat stomach after twins. I didn't - you know my secret now! If you would like to see something on the next By Request blog post, leave a comment or send me an email schoolgatestyle@yahoo.co.uk. Thanks to Stacey for inspiring this one - hope you enjoyed it! I've always believed that at just under 5ft 4, I'm too small for tunics .. as lovely as some of them are. I think they make my legs look even shorter, which is the last thing I want. Having said that, I love the White Company one. Could definitely see myself wearing that. Really wish they'd open a store in Dublin! Boden leggings are great - and I say that as someone who doesn't really do Boden! They are good thickness and length and hold their shape. Best I have found and I must have spent a fortune looking for the perfect legging over the years. Having said that I wouldn't wear them with anything that didn't cover my backside! They are £22 full price but always codes going around. Thanks Jill - yup I'm a bum coverer too lol. I have no idea why my post now has a link to some stripy trousers on eBay. - I certainly didn't put it there! Thanks Avril - I was a bit confused! Love the ASOS tunic- I never think to look there. Have already blown the budget however! I can endorse the Boden leggings too - I love them - well worth the extra bit of money - I tend to size down though as they fit quite big. I love The White company one also! 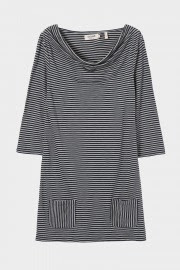 I might have to steal a wear of Laura's H&M tunic jumper when she is at work!! Great post! Great post Avril! I love Tunics but with a tummy no magic knickers are fixing in any way and a bum bigger than any Kardashian they can be tricky. I find skimmers are great. Ones that are close to the bust and drape the hips. Need some knits though definitely! I've got a nice black&grey tunic and black leggings but I just don't know what kind of shoes would look good with it. any advice? Great post as usual! I have tried a few tunics but always bring them back or don't wear them and eventually they go to Oxfam! Maybe being hourglass I need that belt you mentioned Avril?!! Cant manage leggings or skinny jeans either..... there might be a challenge in this for me to tackle! Tunics are hard to find when you're tall but I do have a couple and I just love them. Great selection (as always). I find tunics don't do great things for my shape but a useful post. Thanks. Glad I found this post. 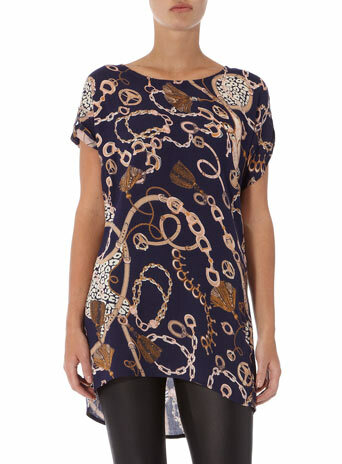 Have been after some more tunic style tops to wear with leggings this winter.